The picture at the bottom of this article might not be the typical nice Rav picture you're used to. But then again, I usually don't work on my pictures when I'm on the Windows side of my computer (I do everything apart from gaming on my Mac), and I only had Paint at my disposal here. I had never used Paint before, what a horrible program that is! I want my GIMP back. Okay, log over to your Mac then, you say. But there's the point: I don't dare to log out of LotRO at the moment. On the picture below you see my captain Ravenwyn. She's alone, very alone. In my kin there's usually 10-20 people online at this time of the evening, but now there's just three. All thanks to the login servers being down at prime time. The whole server feels dead. I had planned on helping some friends in Tower of Orthanc tonight, as they were in desperate need of a captain, but only a handful people managed to log in. The raid leaders also couldn't log in, so we had to call it off. Soon after I was invited by a friend to another raid. They had started before the login servers went down, but lost two people that crashed and couldn't get back in. Sadly it turned out I couldn't help them, as I had inherited an acid lock from someone the other day. So I spent the evening as I imagine most people did: waiting on each other, half of the people being locked outside of the game, the other half "locked in" because they didn't dare to log out. 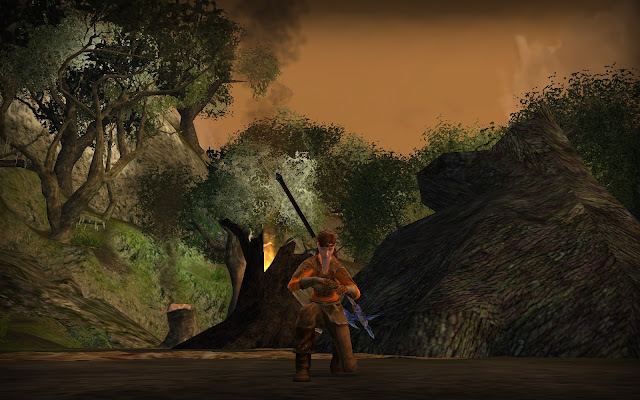 Login server problems have been haunting LotRO the whole day. First time was this noon. I logged on to craft some stuff and was alerted by some friends not to log off. As soon as you quit the game or logged off to log another character, you wouldn't be able to get back in. Problems like this are luckily not something usual for LotRO. I imagine any sort of end-game becoming impossible and people getting really annoyed if that would have been the case. I'm sure they'll fix this, but it's just been a funny night. Turbine currently says the usual thing that they "know of the problem and are working on it", but nothing about what really is going on. I just hope they fix this soon. Update: the servers got back online again at 11 pm, after being offline for over two hours. I did some Isengard three-mans on my captain to make up for the boring waiting. Only one more to go now to complete that quest! My problem in the last days has been with lag. Just a few minutes ago it was so bad my character wouldn't even move for a few seconds. I am unsure if the lag problem is on my side or the server but I wonder if the login problems and the lag are related. Hmm, not sure about the lag, I haven't had any myself. I do lag a bit now and then in crowded cities (such as "Lagtrev"), but that's nothing new. Not sure if that's your pc or your server, but haven't had problems here.